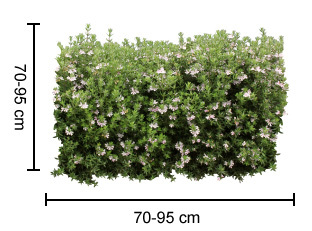 Description: Ozbreed Aussie Box® Westringia can be pruned into a box hedge or left in its natural ball shape whilst staying compact and tidy. 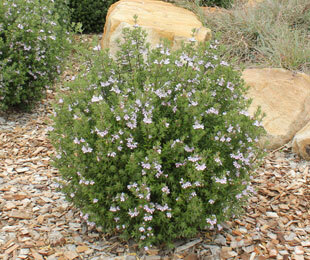 Produces mauve flowers throughout spring/summer and has a dense growth habit. Great alternative to exotic box plants as it has faster establishment and requires less water and needs less pruning than other Westringias. 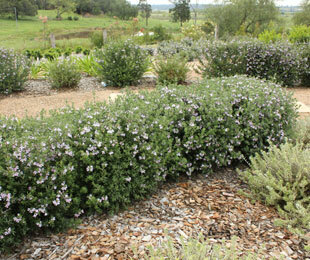 Size: 40-60cm high x 40-60cm wide pruned; 70-95cm high x 70-95cm wide unpruned. NOTE: in QLD and Northern NSW it can grow up to 50% larger in good free draining soils, pruning is recommended in these areas. Where it works: NSW, ACT, VIC, TAS, SA, WA and South East QLD (not suited to Northern QLD). For more detailed information on Ozbreed Aussie Box® Westringia click here.